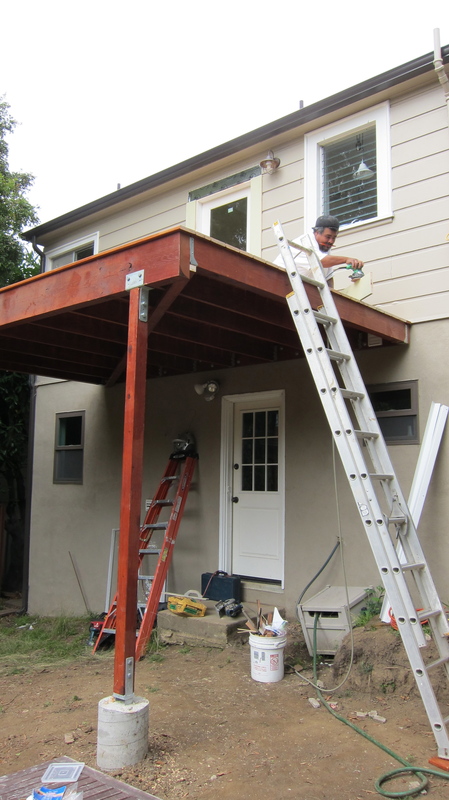 Adolfo (Ron Tostenson Construction) was sanding the decking smooth before staining when I stopped by. The framing and the decking are all glass impregnated wood by TimberSIL and extremely fire and rot resistant. 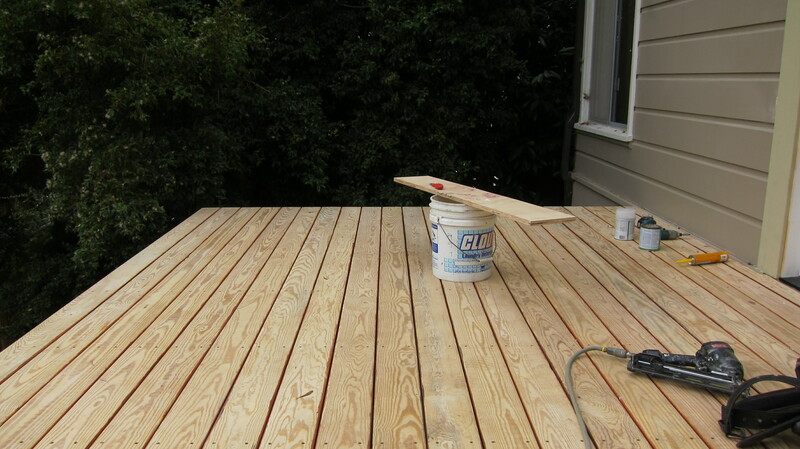 (more info here) Its looking good – much better than pressure treated from below, and the decking is nice too. This is a relatively new and unproven product as of yet, but it seems like a good one to try. The TimberSIL installation manual provides a lot of helpful tips. I think only southern yellow pine is available now, but perhaps it will expand to other species and maybe they can switch to FSC certified wood as well. On Tuesday I visited the Water Conservation Showcase at the Pacific Energy Center. Water-saving products large and small were exhibited. There were many irrigation products including ET Water’s Quickdraw timers controlled from your cell phone and time release water capsules from Driwater. Niagra Conservation gave away a Stealth Toilet that uses .8 gallons per flush as a door prize. Unfortunately they did not have a demonstration toilet on display. D’mand Systems was there with their latest models of pumps to recirculate the lukewarm water back to the heater and not down the drain. CUDO water storage system showed off their stackable cubes for water storage. Pacific Interlock demonstrated their porous paving stones. It was enlightening to watch them pour a glass of water directly on top of the paver and it soaked right through. I had been under the assumption that porous pavers meant pavers with holes for water to drain and plants to grow through. 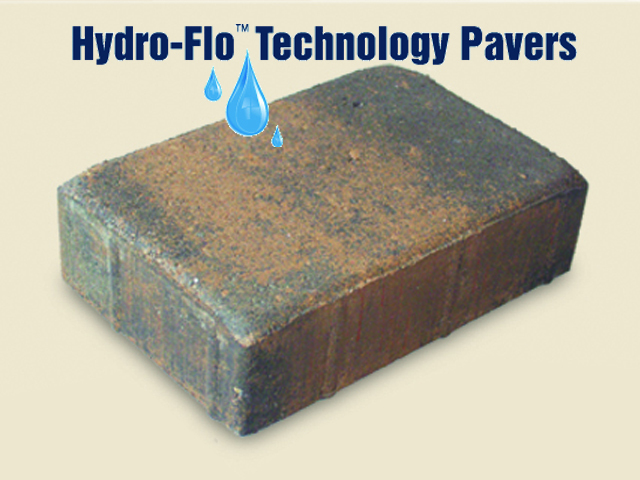 These look like conventional bricks, just have tiny pores to drain the water. There were also many representatives of grey water and black water treatment systems. I think you get pay back pretty quickly on a large building or development if you can recycle some of your water. These systems are still too expensive for the average single family home owner. In a place like the bay area, where rainfall is concentrated seasonally, storage often does not make sense. It is more practical to use rain water in wintertime for wash or toilets, and to reuse shower and sink water for toilets and irrigation during summer. Expensive filtration is required by code for any reuse of rainwater or grey water for plumbing purposes. It is now permitted in many jurisdictions to use grey water (only from laundry and bathroom sinks and showers,) for irrigation without filtration. Dual flush toilets are another great way to conserve water!